On this page you will find information regarding DVB-T PCI cards. The following table lists the confirmed working DVB-T PCI cards and provides a brief summary of their features and components. If you need more technical information on a device, have a look at its specific wiki article. Warning some people experience problems with this card search for mt352_read_register on the mailing list. Works on Ubuntu 6.10 "almost" out of the box. Tested on 32bit Fedora 9. Hangs at least older kernels (<2.6.12) unless the bttv module is loaded with parameters "i2c_hw=1 card=0x71". This may cause boot problems when the module is automatically loaded by hotplug. Revision 2 of this card has just been released (image). 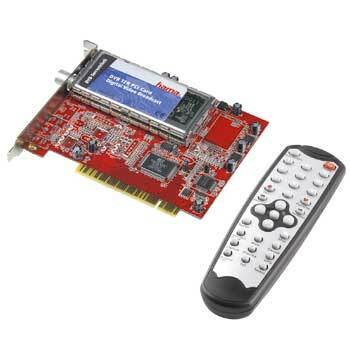 The new card uses a DIBCOM tuner and modulator and does not work under the current driver. Like this, but slightly longer with a heat sink. As of 28/08/2008, according to Michael Krufky, all currently released versions, including the Diversity model, are supported by head of v4l-dvb hg, and the driver is likely to stay ahead of new card releases in the future. PCI 2.2 card using 3.3V. Failed to run on PCI 2.1 system. This card has tuning problems in MythTV and Kaffeine (works with tzap). See the card page. Supported with the latest 2.6.18 kernel, need latest v4l-dvb (mercurial) to work on older kernels. See . FM, TV, SAT, S-VIDEO IN, LINE IN, IR. Supported in the Linux kernel since version 2.6.28. There are three versions of this card, one with a Samsung tuner similar to the AVerMedia 771, another with a Thomson tuner (similar to the Nova-T 90002) and another with Thomson tuner DTT 7579. All versions are supported. Automatically detected by recent Linux kernel. Requires 'modprobe saa7134-dvb' to enable DVB. Automatically detected by recent Linux kernel. Requires 'modprobe cx88-dvb' to enable DVB. Suspected same card as KWorld_V-Stream_Xpert_DVB-T_PCI. NOTE: This card is IDENTICAL to Leadtek DTV2000DS, except for the USB ID, the remote, and the sticky label on the tuners! So please refer to DTV2000DS for extra info. Dual DVB-T tuners, also known as PEAK DVB-T Dual tuner PCI (221544AGPK) Working as single tuner card (at least) on 2008-06-05 http://linuxtv.org/hg/~anttip/af9015-mxl500x-copy-fw/ http://www.otit.fi/~crope/v4l-dvb/af9015/af9015_firmware_cutter/firmware_files Ref http://marc.info/?l=linux-dvb&m=121268349100641&w=2 A single tuner variant (PC-160-T) is now also supported. From my experience, the latest driver (23/03/12) has some bugs that require daily hard resets of the device. KWorld support are not interested in providing any assistance getting the device working: "Sorry,we can't help you to solve the remote problem in Linux,since we don't highlight/mention that it can support this system. If you have the problem in Windows system,we are willing to help you solve it." Drivers are included in the Kernel. The tuner works with Mythbuntu 9.10 as does remote. The tuner works with Mythbuntu 7.10 (i386) but the remote doesn't. In Australia, this card appears to have been superseded by the DTV 1000 S which uses a different chipset and apparently is not supported. Works with patch available at http://istvanv.users.sourceforge.net/v4l/xc4000.html. Tested with Kaffeine and Australian DVB-T Broadcasts. IRC works but default key mapping is incorrect with KDE4 - needs work. Read the page regarding the working status of this card. Warning: The DTV2000DS PLUS is completely different. Dual DVB-T tuner card with DAB+ radio. Comes with remote control, IR sensor and low profile bracket. Partially supported. Can be made to work at least with Xubuntu 12.04 kernel 3.2 - see card page for details. Remote and DAB+ are untested. Warning: The non-PLUS version is completely different. DTV + audio worked out of box in Mythbuntu 8.10 and Ubuntu 8.10. 107d:6f42: Works with patch available at http://istvanv.users.sourceforge.net/v4l/xc4000.html. 107d:6f44: DVB-T works with "options cx88xx card=81" (using the vanilla v4l) in /etc/modprobe.d/video4linux but none of the other inputs work. Analog works with "options cx88xx card=51" but DVB-T doesn't, even when tuner=71 is specified. Supported by Linux kernel 2.6.10.
analog tested in tvtime with 3.2.41 - both TV and Composite-in parts work, You need to redirect audio from the device to your soundcard. Antenna In on the backplate. As of kernel 2.6.23.13 the frontend seems to not work, even with "card=94"
This card mostly works with the latest drivers as of 2008-02-08 (tested using mythbuntu 2.6.22-14-generic kernel). There is a problem with unreliable firmware loading. The card only works if the firmware loads correctly. Uses same (out-of-tree) drivers as the T1800B. Driver appears to have bug which prevents getting a signal lock if more than one of these cards are present. July 2006: Worked out of the box with recent kernel 2.6.17 Debian unstable! Hybrid DVB-T / Analogue card. Quality better than Pinnacle software for win xp. Comes with remote control. Uses Pinnacle's own application, might not be avalable for Linux. Not supported yet by present kernel release (2.6.25). A patch is on the way. Latest v4l-dvb drivers should be manually compiled (this requires kernel 2.6.19 or higher). This card is not suitable for KnoppMyth R5F27, as the aforementioned workaround may be tricky to apply to the distro's kernel (2.6.18-chw-13). Onboard connector to Common Interface extension kit (not included). Remote and LIRC Compatible Serial Dongle Included. The TT-DVB-T 1200 is the only known "full-featured" DVB-T Card. Can only tune UHF channels: VHF is not supported with this card! Common Interface (on board connector). Needs to be bought separately. TT-PCline Budget3 TA1000 ca. 90 € ? ? Drivers from linuxtv.org work fine, no special options needed. Has remote included, does not work for me in linux so far. Note: There is an unsupported newer revision under the same name, see below. ca. 70 € Works ok with FC4 latest 2.6 kernel and cx88xx option card=42. Cannot use the DVB, Analogue or FM tuners simultaneously. to not have overlay switched on. ~ £25 in UK Works ok with FC7 latest 2.6 kernel and saa7134 module, card=109. DVB Works with "options cx88xx card=43"
Remote and external antenna included. Same components as Winfast DTV1800 card. Analog works with "options cx88xx card=81" in "/etc/modprobe.d/video4linux"
Basic testing with Kaffeine. Kaffeine detected the card and scanned for channels, however testing was done in Canada where no DVB-T signal exist. it seems to be a Geniatech DVB-T TV Hybrid X8000MT; windows drivers of both cards are the same. from skimming the source code of the xc3028 driver(kernel and geniatech) it seems to me that the xc3028-v27.fw firmware is simply a binary compound of the same components(though the length of the chunks seems to differ) that are provided in the geniatech firmware. This page was last modified on 19 October 2018, at 11:26. This page has been accessed 733,473 times.